I finished off the silk kerchief on Sunday night after knitting a couple of extra rows to make sure that bright pretty turquoise made its appearance. I’m pretty pleased with how it came out. This was my first time working with Noro and I guess my experience was the same as a lot of knitters: its not exactly soft, that Noro… but it sure stripes beautifully. Its so exciting to keep going a couple of more rows until the next color pops up. This was such a great pattern for using Noro. I think there might even be just enough yarn in each ball to knit another one. gorgeous!! it turned out great. Glorious. 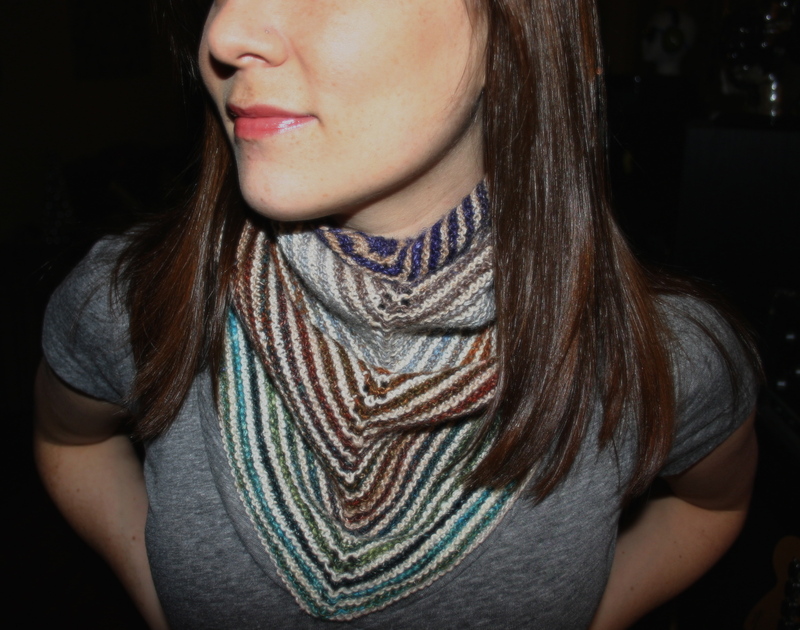 You just cannot go wrong with Noro, can you? Very pretty! I do think Silk Garden softens up a good deal when you wash it. I use Eucalan and give it a good soak. Then again, I guess I’ve only used the worsted weight SG. that little guy is so cute!! I love it! It looks fabulous!